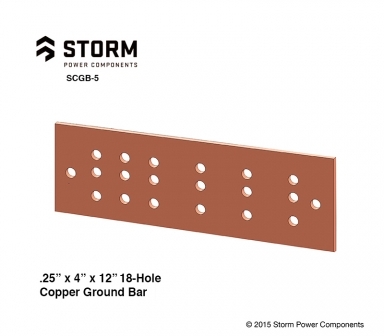 Designed and manufactured by Storm Power Components' Tennessee fabrication center, these solid copper ground or bus bars are the industry standard for equipment grounding. Each computer-machined ground bar is finished by hand and individually inspected before the "stamp" of approval is given. The Storm process not only ensures that UL and other certification are met, it offers peace of mind to engineers and electricians that they have installed the safest grounding possible. Tin and nickel plating, and silver flashing are also available, as well as time-saving bus bar mounting kits, or as ground bar kits with busbar and mounting kits combined. Call 800-394-4804 for quantity pricing. Designed and manufactured to enable fast, easy bus bar installation, meeting all known grounding requirements. Includes: (2) Mounting Brackets, (2) SPCI4200A5 Standoff Insulators, (2) 3/8"-16 X 3/4" Bolts & Lock Washers. Copper Ground Bars have pre-drilled mounting holes that fit the Bus Bar Mounting Kit. Manufactured by Storm Power Components.